Turning the everyday into something romantic is one of the best ways to keep a relationship happy and healthy. 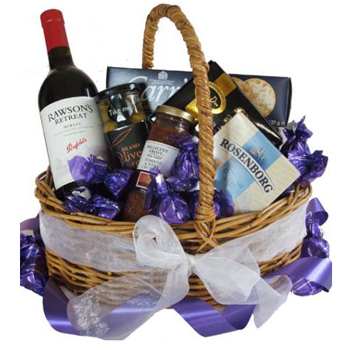 Add this gourmet gift basket to your enchanted evening and she's sure to fall for you all over again. Your recipient will receive a bottle of Penfold's Rawson's Retreat Merlot (750 ml), delicious Millicent Grove Tomato and Herb Chutney (165g), creamy Rosenborg Mild Danish Brie (125g), an assortment of Chocolate Truffles or Toffees, and so much more. Invite her to a getaway for two with Savory Love.